If your new housebroken puppy or rescued dog occasionally pees on the floor for no apparent reason, then you might have a dog with a submissive or excitement urination issue. Any inappropriate urination, regardless of where it occurs, could signal an underlying health problem, so it's worth knowing what submissive or excitement urination looks like and when something more serious may be going on with your dog. For older dogs, occasional incontinence is to be expected. For housebroken puppies, it often takes some serious sleuthing to find the root of the problem. If your dog doesn’t pee when you’re in a dominant position (i.e., looking your dog directly in the eye, bending from the waist, greeting your dog face on), chances are it is suffering from an excitement issue. If your dog does pee when you arrive home, when you’re in a dominant position, or when it's in trouble, then it’s probably a submissive issue. Either way, the situation can be remedied. Why Do Dogs Urinate When Submissive? Dogs that urinate submissively are trying to appease someone they see as "socially dominant" and to escape being punished. Submissive dogs pee when they're greeted, when someone approaches, and when there's a history of rough treatment or punishment after inappropriate peeing. This is common in rescued dogs and shy, anxious, and timid dogs. To fix submissive peeing, avoid hitting, scolding, or yelling at your dog after it has peed. Instead, try to build its confidence by teaching it simple commands (sit, stay, come), and reward it after each success. This is the same reward-and-praise process you use to teach simple tricks (roll over, fetch). You'll also want to interact with your dog in nondominant postures. Avoid direct eye contact, approach from the side, and crouch down to your dog's level. When petting your puppy, go for under the chin rather than the top of the head. Keep all greetings low key and take your dog outside to relieve itself as soon as you get home. If your dog pees in the house, simply clean it up without fuss and go away. Don't forget to reward and praise your pup when it pees in the appropriate spot. Why Do Dogs Urinate When Excited? The good news for you is that excitement peeing usually happens to puppies under 1 year of age, and they typically grow out of it. The bad news is they're not going to lose the habit overnight. These are the dogs that pee while playing, when you come home, or when unfamiliar people visit. Patience and understanding will go a long way toward training a puppy out of this behavior. To help your puppy with excitement urination, maintain a calm, quiet demeanor and be consistent. Try keeping all playtime outside or on a specially prepared area of newspapers and puppy pads. This way, if there is a little accident due to overexcitement, it doesn't have to be a big deal. When there's an accident, just as with submissive peeing, don't reprimand or punish your pup. Simply clean it up quietly and leave the puppy or dog alone. Be sure to clean up any stains thoroughly, preferably using an enzymatic cleaner, so the dog doesn't smell the urine scent and think it's OK to pee in that area again. Give your puppy treats when it pees in the correct place and keep all greetings to a minimum. You may even want to ignore the dog when you arrive home. Does this seem cruel? It's not really, as it gives your dog a chance to calm down on its own. Ask guests to do the same. When your dog pees while out on walks, give it praise and treats. The same goes for peeing in designated areas (rather than the rug). All these things should not only help your puppy break its habit of peeing when excited but will also help you to cultivate a calmer, more confident dog. Before trying behavior modification, take your puppy to the veterinarian to rule out any health problems. A urinalysis will show whether your dog has a urinary tract infection, which can be treated with antibiotics. It also should show whether your puppy is suffering from bladder stones or cystitis, which is bladder inflammation. In addition, your vet will check for any indications of kidney disease or diabetes, both of which can lead to inappropriate urination. Most medical conditions that cause your puppy to pee uncontrollably can be treated with antibiotics, although kidney stones may require surgery. Your male dog may urinate in the house (or another inappropriate place) after it has been neutered. Sometimes dogs feel the need to mark their territory after this procedure, and it's not entirely clear why. If the peeing continues for more than a week, though, that's a sign that your dog is doing more than marking its turf. When you've tried everything but your dog continues peeing when excited or submissive, you may need to take it to a licensed veterinary behavior specialist. 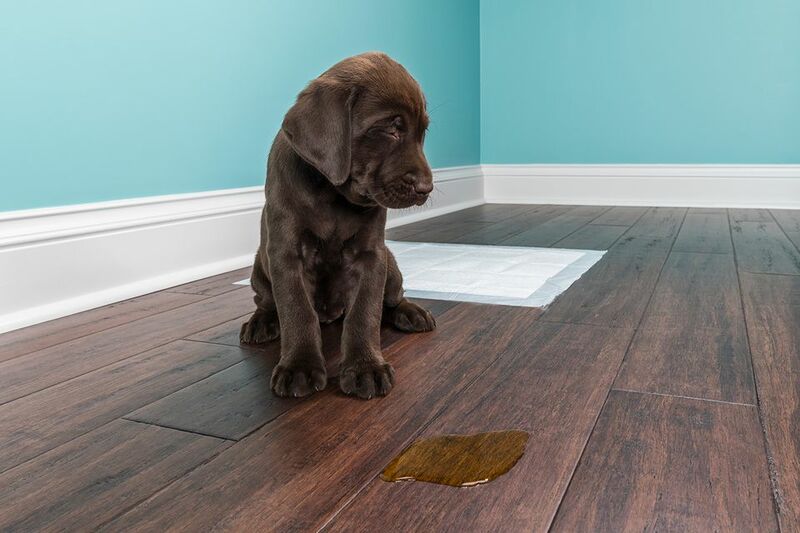 Sometimes getting a professional point of view on the problem can help; a specialist may be able to see patterns in your puppy's behavior that you're missing.